Many of us who grew up in the 50’s and 60’s have fond memories of watching The Andy Griffith Show. I loved watching Andy and Opie walking down the path with their fishing poles at the beginning of each of the older episodes. It was this image that was chosen for a statue in Mount Airy, North Carolina. 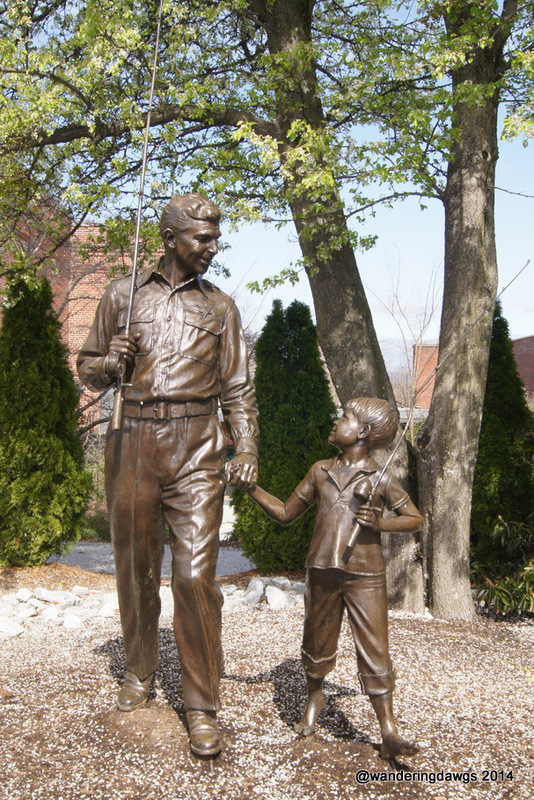 Mount Airy is the birthplace of Andy Griffith. A walk down Main Street is like walking through the fictional town of Mayberry. Just a few blocks from Floyd’s Barber Shop you can visit Wally’s Service Station and the Mayberry Courthouse. After breakfast at the Snappy lunch (famous for their pork chop sandwich) we visited the Andy Griffith museum which contains exhibits from Andy’s long acting career. In addition to playing Sheriff Andy Taylor of Mayberry, he was in several movies and later played TV’s Matlock. He was awarded the Presidential Medal of Freedom by President George W. Bush in 2005. After the museum we walked through an exhibit about Chang and Eng Bunker, Siamese twins who settled in the area and raised their families in the 1800’s. We couldn’t leave town without stopping at Wally’s Service Station for a look around. After driving by Andy Griffith’s home place we drove north on Highway 52 for a drive on the Blue Ridge Parkway. We turned onto the Blue Ridge Parkway at Mile Marker 199 in Fancy Gap, Virginia and continued going north. After stopping to take a short hike we arrived at Mabry Mill to discover that none of the facilities on the parkway are open until May 1. No worries. I was able to take pictures from the parking lot. We spent 2 nights at the Mayberry Campground in Mount Airy. It’s great to be on the road again! We enjoyed Mount Airy when we were there a number of years ago. I love driving and exploring the Blue Ridge Parkway. Hope you see some bears. Sherry, we didn’t see any bears! Maybe you will see some on down the road. Some of my favorite places… our RV is in for repairs for another two weeks and I’m ready to go. The weather has been perfect for camping and I know the wildflowers in the Smokies and along the Blue Ridge Parkway are out from all the photos I have seen posted! Enjoy your spring excursion Beth! Holly, we had to get some work done on our RV before we could make this trip so I feel your pain! There weren’t any wildflowers on the Blue Ridge Parkway where we were but we did see some at Natural Bridge. This is a nice time of year to visit the area. It’s not too crowded yet. We stayed at the Mayberry Campground in Mount Airy. This could be a good stop. We were at Blue Ridge last year and will be in the area for some maintenance in Gaffney, SC. Hope we can catch some of the spring blooms. Sorry you are having to have some maintenance done. The campground in Mt. Airy was convenient for exploring the town of Mt. Airy and the Blue Ridge Parkway. You should see some pretty wildflowers this time of year.